SMI offers a full line of precision milling and turning services to support our customers machining requirements, as well as our in-house production and tooling needs. This in-house resource gives our production planners the ability to schedule large or small production runs as needed, eliminating the need to outsource from companies with 6 to 8 week lead times. Having control of our machining schedule gives our planners the flexibility to respond to changing delivery schedules and drawing revisions in a timely manner without incurring unnecessary cost. 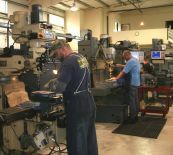 Our machining center also supports our prototype and tooling departments. SMI maintains a separate machining center and staff to support our prototype and tooling needs so as not to disturb production flow.